Our annual 48: A Slum Experience will be held March 29-31, 2019! This year’s theme explores Isaiah 1:17, which urges us to take care of the orphans, advocate for those who are widows, and bring justice to the oppressed. Our annual retreat gives students and leaders an opportunity to experience how approximately 1 billion people live every day in our world. For 48 hours, participants live in SIFAT’s simulated Urban Slum and are challenged to interact with characters played by staff and volunteers to meet their basic needs of food, water and shelter. After the experience, participants are challenged to reflect on what their new connection with the people living in these conditions is. 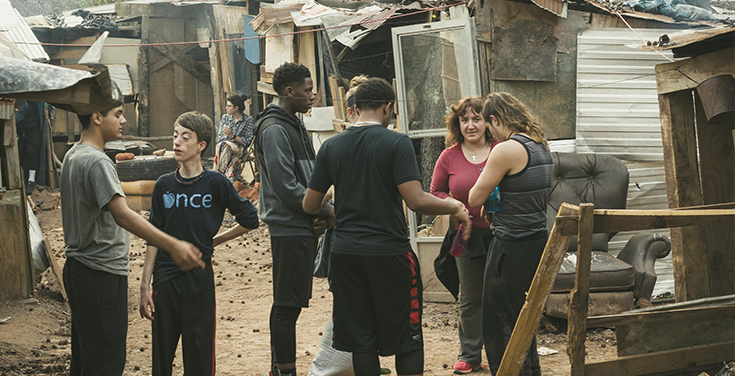 This event is one of our most challenging experiences, and it is a great opportunity for connecting students to the lives of those in oppressive poverty that they may never get to experience otherwise. Because of the intensity of this programming, the retreat is recommended for mature youth in 9-12th grades. Start Time: Friday, March 29 at 4 p.m.
End Time: Sunday, March 31 at 4 p.m. Registration: Email learnandserve@sifat.org for more information. We also are in need of college age characters. Email learnandserve@sifat.org for more information.